A mom takes the family back to her old stomping grounds in Macon, known as Middle Georgia, and discovers museums, monuments, music and great eats in the heart of the Peach State. Not long ago, after spending a decade in Northern California, my husband and I moved our family of four back to my childhood home of Middle Georgia, a place I love more than any other. Like a kindergartner at Disneyland, I was beside myself with the excitement of playing weekend tour guide to my husband James and our young sons Andrew and Jack. If you've ever had the privilege of visiting Macon, the heart of the Peach State, you know that it's one of those magical places that linger in your heart long after bidding adieu to its white columns and soulful melodies. We started our family tour in Macon's historic, yet eclectic, downtown, taking in a few museums and some fantastic Southern cooking. Macon is a city that's synonymous with musical tradition, where Southern rock, rhythm and blues seem to flow through the water system. 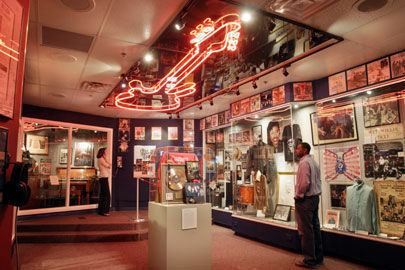 It's home to legendary stage acts like the Allman Brothers, Otis Redding and Little Richard. Maconites (as they call themselves) don't just listen to music; they live it. To give James and the boys a lesson in Georgia's past and present musical influences, we took a walk downtown to the Georgia Music Hall of Fame, an interactive museum and concert hall celebrating homegrown talents too numerous to name; sadly the Music Hall was shut down 2011. Strolling through the marvelously realistic exhibits, we lost ourselves in the Vintage Vinyl Café among neon guitars and original memorabilia from Lynyrd Skynyrd, REM, Atlanta Rhythm Section, Toni Braxton, the B-52's and the Tams. In the Skillet Licker Café, my boys, who tend to lean toward country music, sang along with their favorite Alan Jackson and Tricia Yearwood pieces. The Jazz and Swing Club, like stepping back in time to shadowy speakeasy, entranced us in the sounds of Johnny Mercer and Lena Horne. 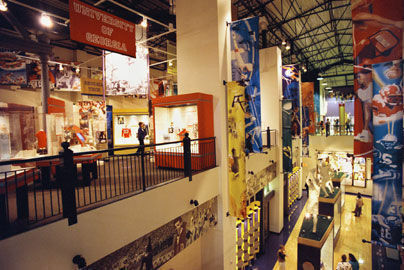 Just across the street is the Georgia Sports Hall of Fame (478/752-1585). As we walked through the doors, my 43-year-old husband became a 10 year-old once again, his eyes lighting up to see memorabilia of baseball idols like Hank Aaron, Jackie Robinson, Ty Cobb and Phil Niekro. Andrew would've spent all day in the NASCAR Atlanta Motor Speedway simulator; while Jack jumped up and down happily every time he rang a basket in one of the kid friendly basketball hoops. After getting our fill of Georgia's music and sports legends, we took a walk over to Walnut Street to the Tubman Museum (478/743-8544), a gallery named for Harriet Tubman, an African American woman who led countless slaves to freedom and served as a Union nurse, spy and scout during the Civil War. In this 8,500-square-foot archive, we got a lesson in African American history through engaging exhibits of folk art, relics and inventions. Andrew and Jack especially enjoyed the vivid pictorial storytelling of the African Griot, (a series of narrative paintings that read like a picture book). In the spring, the Tubman Museum hosts a Pan African Festival, celebrating the influence of African culture throughout the world. 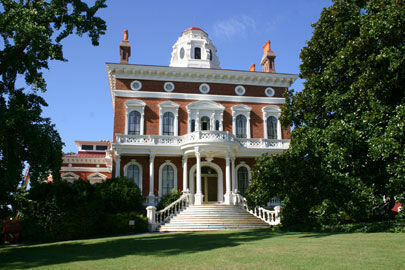 For lovers of grand Antebellum architecture at its finest, Macon offers a feast for the eyes. Turn down any street in the downtown area and you'll be transported to pre-Civil War America, a more genteel time where horses pulled buggies down cobblestone streets (yes, a few of them are still cobblestone) and women in hoopskirts were escorted by Southern gentlemen up the steps of their lovely mansions. A few spectacular homes that offer public tours are the Hay House, the Cannonball House, the Sidney Lanier Cottage and the Woodruff House on Coleman Hill, which offers the best views of the city. Maps are available at the Macon Convention and Visitors' Bureau (478/743-1074). For lunch, there was only one option for our hungry foursome in this city of song and soul – The H & H Restaurant (478/742-9810), where soul food inspired the songwriting talents of the Allman Brothers back in the day – and even had Oprah Winfrey raving on an unannounced visit. This hole in the wall eatery doesn't offer a whole lot in décor, but who bothers to look around when there's such mouthwatering food right in front of you? We feasted on fried chicken, barbecued ribs, homemade macaroni and cheese, lima beans and apple cobbler; and there was much more to choose from. Mama Louise, the H & H's proprietor, was there to greet each of her hungry patrons. For those desiring more than Southern cooking, Macon has a surprisingly vast selection of charming restaurants and cafes. The Back Burner (478/746-3336), on Ingleside, offers a delightful French provincial menu, while Marco(478/405-5660) takes diners on a world class Italian culinary tour. If you like New York-style pizza pie in a funky and fun atmosphere, don't leave Macon without a visit to Ingleside Village Pizza (478/750-8488). Andrew and Jack are always enchanted by the off-beat, fun house décor and get a thrill from watching the chefs toss pizza dough high into the air. Well before Mama Louise fried her first chicken, and the Hay House was still centuries away from construction, Native American people called the Mississippians lived on the land around what would be Bibb County. Between 900 and 1,200 AD, they were skillful hunters and farmers and developed a distinctive culture. 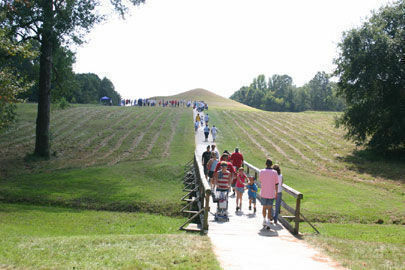 Today, visitors to the Ocmulgee National Monument (478/752-8257) in East Macon can tour the sacred Mississippian burial mounds and examine artifacts left behind from so long ago. After many trips here, I still get a feeling of connectedness to the past as I hike along the tall, rounded mounds. The Mississippians left a pervasive spirit on this land that visitors can sense. Looking for a perfect picnic site on a sunny day? There is no better place than Ocmulgee National Monument. There's no doubt that my boys' favorite place in all of Middle Georgia is the Museum of Arts and Sciences (478/477-3232). They delighted in getting a personal tour of the solar system in the 40- foot diameter dome planetarium, where each planet came to life right in front of our eyes. At the museum's mini-zoo, we got up close and personal with exotic animals like four different types of geckos, macaws, a hedgehog -even a Chilean rose-haired tarantula. They even got a lesson in modern day pottery from local artist. Middle Georgia's charm and culture isn't all within the limits of Macon. Just a short drive south, visitors will find a completely different vibe in Warner Robins. Named after the bustling Robins Air Force Base (478/926-1001), one of the largest and most productive in the country, Warner Robins is a modern, progressive city that continues to experience growth each year. 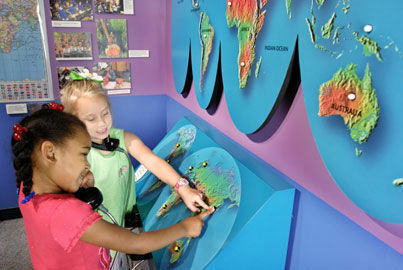 The Museum of Aviation (478/926-6870), located on RAFB is a "can't miss" attraction, especially for children and flight enthusiasts. James, Andrew and Jack marveled at the overwhelming array of aircraft: bombers, cargo planes, fighters, helicopters, missiles and drones; a veritable military aircraft wonderland for wannabe pilots, young and old, to explore. We took turns in the transporter, simulating flying and roller coaster experiences; then we strapped into an F-15 cockpit and toured the mammoth C-130 cargo plane. That adventure had both Andrew and Jack planning to become pilots when they grow up. While Macon is big enough to have all of the staple hotel chains conveniently located along I-75, I tend to prefer the more intimate, nostalgic setting of a bed and breakfast. 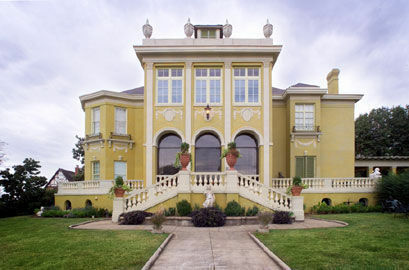 The 1842 Inn (877/452-6599), a Greek Revival Antebellum mansion near downtown makes any stay seem like a special occasion. The Ramada Plaza (478/746-1461), also downtown, is a 16 story high rise with more straightforward amenities. It's an easy walk from The Georgia Music and Sports Halls of Fame. There's always something going on. Macon is home to some fantastic festivals and celebrations. If your family is looking to experience Macon from a local's point of view, visit Georgia Family.com to learn about family-friendly events and other activities you can do during your stay. 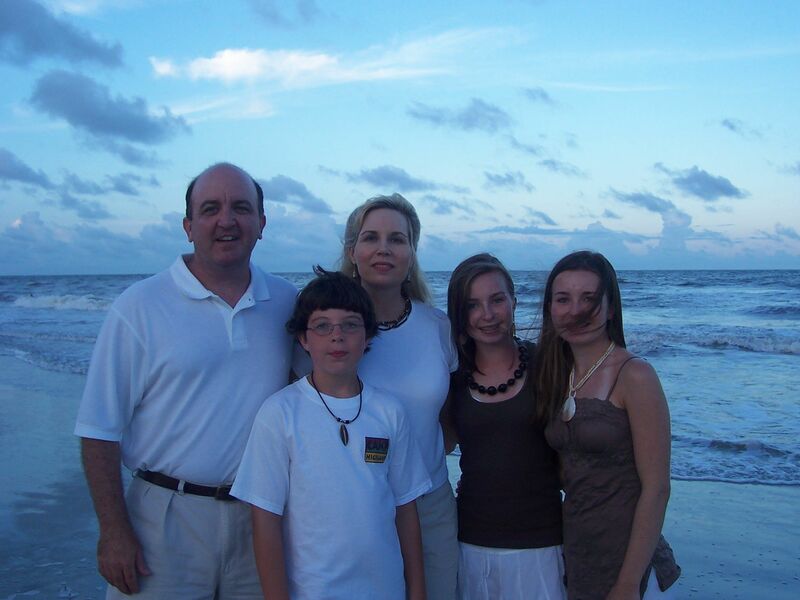 Georgia Family is a free, monthly magazine that is distributed throughout the state. Pick up a hard copy as you explore the city for other ideas.